Since Alice in Wonderland chic is in vogue with the new Tim Burton film, this flash drive is definitely a good way to carry extra a few extra gigs of storage. 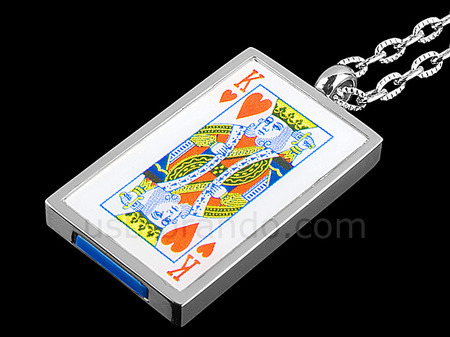 USB stick du jour is this rakish King of Hearts card necklace flash drive. Sling it round your neck, and the top clips off to reveal the USB insert. We are BULK PRODUCTS LIMITED .strive to offer high-quality products at competitive prices. All of our products are brand new, never used, never rebuilt. We maintain multiple-supplier sources for our products as a means of being able to continually offer the best products at the best prices. uses an application called facetime to make video calls over wifi. Brand new Apple iPhone 4,Apple iPad 2 64GB,HTC HD2, BlackBerry Touch 9800 Slider Blackberrry Onyx 9700, Blackberry Storm 2, Nokia N8, Nokia N97 Mini. All original in factory sealed boxes plus 12 months international warranty. This phone is unlocked and can be used with any SIM card. Pin already Unlocked. Limited offer: Buy 3 pay for 2: Iphone 4G/ 3Gs/Nokia E7/N8/BBBold2/Apple HD/ LCD Tv’s : Free shipping + Discount: for more product info: e-mail: [email protected] or voice chat:[email protected] or call us on +1-360-991-7344(USA Office) Or +447031744718(UK office) & speak to a representative directly.